What better way to recover from your holiday shopping than to invest in companies that'll send you a check? Here are seven we think deserve a closer look. Great dividend stocks are as close to a money tree as you'll find. Image source: Getty Images. Dividend stocks can make for wonderful investments -- particularly companies with a strong track record of giving shareholders a reasonable payout while still retaining enough cash to invest in growing the business. We reached out to seven of our top contributors and asked them to discuss a dividend stock that investors should have on their shopping list right now, and they gave us a diverse group including Johnson & Johnson (NYSE:JNJ), Nike (NYSE:NKE), Procter & Gamble (NYSE:PG), Consolidated Edison (NYSE:ED), Sysco Corporation (NYSE:SYY), Raytheon Company (NYSE:RTN), and Enterprise Products Partners L.P. (NYSE:EPD). Are you looking to get paid in 2017? Look no further than these stocks. Keep reading to find the ones that are right for you. Steve Symington (Nike): Shares of Nike are down nearly 20% this year, but that certainly isn't a reflection of the sportswear and shoe juggernaut's latest financial results. More specifically, Nike shares climbed modestly after the company delivered a strong fiscal second-quarter 2017 report two weeks ago. Revenue climbed a better-than-expected 6.4% year over year (8% at constant currency), to $8.18 billion, driven by an 8% constant-currency increase in NIKE Brand revenue, to $7.7 billion, and a 5% increase from Converse -- a business Nike acquired in 2003 for just $305 million -- to $416 million. Within the former was 5% growth in NIKE Brand footwear, to $4.82 billion, and a 7% increase in apparel revenue, to $2.54 billion -- both solid, but not overwhelmingly impressive results given today's increasingly competitive retail environment. Nonetheless, Nike remains a financially sound, cash-generating machine bent on returning capital to shareholders. The company ended last quarter with $5.9 billion in cash on its balance sheet, down only $173 million from the same year-ago period despite making hefty investments in infrastructure, repurchasing 56 million shares for $3.1 billion under a four-year, $12 billion repurchase program authorized in November 2015, and increasing its quarterly dividend (for the 15th consecutive year) two months ago by 13%, to $0.18 per share. At today's prices that equates to a solid annual yield of roughly 1.4%. Combine this with Nike's steady supplemental capital returns and top- and bottom-line growth even in the face of currency headwinds and persistent competition, and I think Nike stock is a worthy portfolio candidate for any dividend-seeking investor. Brian Feroldi (Johnson & Johnson): When it comes to dividend stocks, I'm a firm believer that investors should favor companies that have stood the test of time. If that sounds like a reasonable strategy to you, then I think you should seriously consider adding Johnson & Johnson to your watchlist. This company's long-term history is nothing short of remarkable. Johnson & Johnson has grown its adjusted profits each year for more than 32 years in a row. 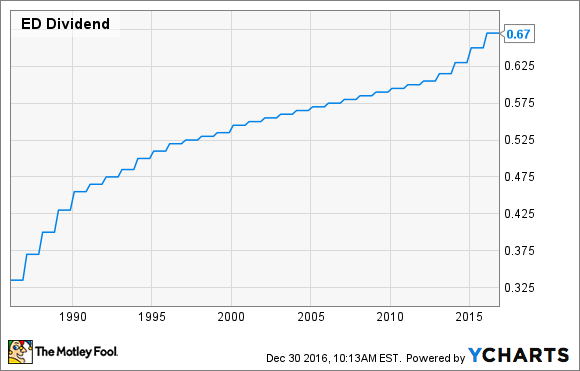 Better still, the company has annually increased its dividend -- which currently yields 2.75% -- for 54 consecutive years. That's an amazing streak that spans multiple recessions, which is telling about how strong this company is. Johnson & Johnson has been able to put up those amazing numbers in part because consumers and healthcare professionals alike trust its brand. That strong connection is a big reason that the company holds the No. 1 or No. 2 position in about 70% of the markets in which it competes. While J&J's stock is currently trading near its all-time high, its trailing price-to-earnings ratio is only 20. That's a discounted valuation when compared to the S&P 500 in general, which makes this a great stock to buy today and to add to on any future dips. Neha Chamaria (Consolidated Edison): If you're looking for good dividend stocks, how about a defensive utility stock that boasts good cash flow and a track record of dividend increases, and has recently pulled back in price? Consolidated Edison stock's 8% drop over the past six months offers income investors an opportunity too good to ignore. As a regulated electric and gas utility that charges decoupled rates, Con Ed knows well in advance how much in revenue it will generate, which is a huge advantage for any business organization. As fixed revenue means pretty stable earnings, Con Ed has been able to reward shareholders richly over the years: It has increased its dividend for 42 straight years now. ED Dividend data by YCharts. That dividend streak is unlikely to break unless people learn to live without electricity and gas. In fact, Con Ed's growth plans stretch well into two decades, reflecting management's foresight and confidence in the business. From modernizing its existing network to investing billions in renewables like solar and wind, Con Ed has its plans in place. These investments should help the company expand its customer base and further bolster its position in the industry, which should translate into rich dividends for investors for years to come. Given the stock's recent drop and a dividend yield of 3.6%, I believe it's time to load up on Con Ed. Evan Niu, CFA (Procter & Gamble): Given the fact that I'm a tech analyst, it might be surprising that I'd advocate putting Procter & Gamble on your dividend stock shopping list. But that's actually precisely the point, at least for my personal portfolio. My portfolio tends to be overweighted in tech, since that's primarily what I follow, and the search to balance and diversify my portfolio with a solid non-tech dividend payer led me to put the household name on my own personal shopping list. To be clear, I haven't bought shares yet, but it's definitely one of the candidates. Procter & Gamble really requires no introduction, nor does its plethora of brands that you probably buy every time you go to the store. It's no surprise that P&G is one of the market's favorite dividend stocks, and has consistently paid out for over 125 years. The company is a paragon of implementing a consistent and sustainable dividend policy, including modest but healthy increases every year -- all while maintaining conservative payout ratios that don't put the dividend at risk. Shares yield around 3.2% at current levels, which should please income seekers. It's true that the company has hit a few headwinds in recent years, including a difficult foreign exchange environment that hurt international sales, and it began streamlining operations by getting rid of more than half of its brands a couple of years go, but overall Procter & Gamble is a solid pick. Daniel Miller (Raytheon): If your shopping list is anything like mine, it might have changed quite a bit since November. However, one of the stocks high on my list remains -- and, in fact, has become slightly more intriguing since Donald Trump's victory: Raytheon Company. Raytheon is one of five major U.S. defense contractors, with 2015 revenues topping $23 billion and a well-balanced business that generates about 31% of its top line internationally. It operates in five distinct segments, which are also well balanced, with four of those segments generating the vast majority of revenue: Space and Airborne Systems (SAS), Integrated Defense Systems (IDS), Intelligence, Information and Services (IIS), and Missile Systems (MS). Now, while those four business segments generate most of its sales, its fifth segment, a joint venture called Forcepoint, provides cybersecurity solutions to government as well as commercial clients. While it only generated 1% of sales in 2015 and around 3% this year, its cybersecurity business should easily increase its top line in the double digits for the foreseeable future. The need for cybersecurity services isn't going away, and if Raytheon can turn this business segment into a fifth pillar of revenue, this is a company well poised to reward shareholders over the long term. Also, investors can rest assured that Raytheon's recent dividend history has been shareholder-friendly. It has increased its dividend each of the past 12 years, raising it 9.3% in 2016, and also repurchased $1 billion in shares during 2015 alone. Its dividend yield of 2% won't blow investors away, but it's well positioned for the future with strong cash flow, a healthy dividend, and a balanced portfolio of businesses and technologies. Dan Caplinger (Sysco): Everyone has to eat, and among dividend stocks with long histories of growing payouts, Sysco stands out for its track record of success. The company recently announced its 47th consecutive annual dividend increase, making a 6% boost to its quarterly payment to bring its per-share amount to $0.33. That works out to a 2.5% yield, which isn't the highest in the market, but it's still a healthy payout in a market in which that yield manages to match what the 10-year Treasury is paying. Sysco has been able to grow both through smart internal initiatives and with targeted strategic acquisitions. The company's purchase of European food distributor Brakes Group early in 2016 has helped Sysco keep its top line rising, and in its most recent quarter, Sysco managed to grow earnings nearly 30% from year-ago levels. Looking forward, things look even better for Sysco. The restaurant industry, which is a major customer for the company, has started to recover, and those who follow the sector see even better times ahead as a wave of consumer confidence emerges that could send more people out to eat. Even though some investors are still disappointed that the company's attempted acquisition of U.S. Foods was blocked by regulators, Sysco has plenty of room to take advantage of a more favorable business environment and to look for ways to raise its dividend even further in 2017 and beyond. Jason Hall (Enterprise Products Partners): The oil and gas industry continues to be a tough place to invest. 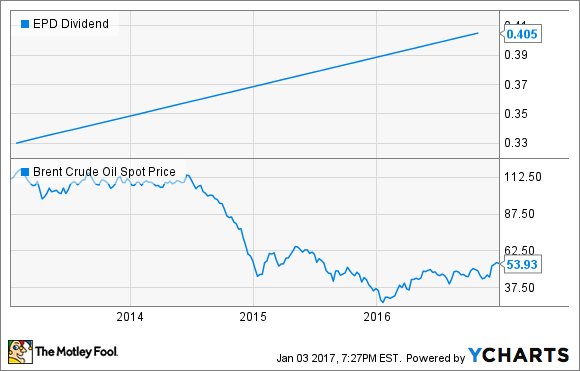 Yes, a lot of energy stocks did pretty well in 2016, riding a recovery from oil prices in February 2016 that were the lowest we have seen since 2004. But even as a lot of oil stocks were coming back from the brink, dozens of former big dividend payers have cut or even eliminated their payouts completely. EPD Dividend data by YCharts. This is partly due to the nature of its midstream operations, which can be largely immune from oil and gas prices, but it's also a product of excellent management, which has done a solid job of playing defense with investors' capital in every market condition. The result? A nearly 6% yield at recent share prices, and a likelihood of more increases in years to come. If you're an income investor looking for an excellent oil and gas stock, look no further than Enterprise Products Partners.